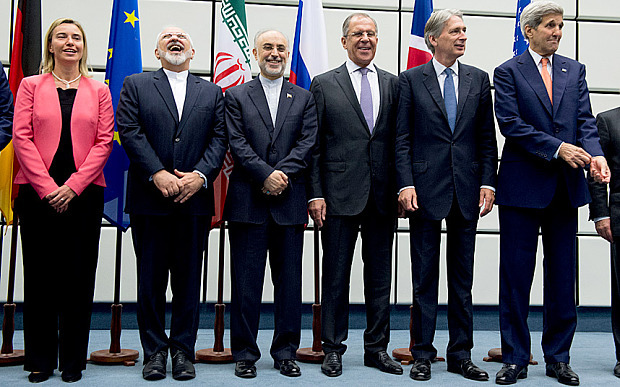 JNN 17 July 2014 Vienna : Iran and six major world powers reached a nuclear deal on Tuesday, capping more than a decade of negotiations with an agreement that could transform the Middle East. Iran and the European Union say the conclusion of nuclear talks between the Islamic Republic and six world powers marks a “historic day” after more than a decade of intensive talks. “This is an historic day also because we are creating the conditions for building trust and opening a new chapter in our relationship,” said a statement read by EU foreign policy chief Federica Mogherini and Iran’s Foreign Minister Mohammad Javad Zarif in Vienna on Tuesday. Iran and the P5+1 group of world powers concluded talks on Joint Comprehensive Plan of Action (JCPOA) , which will put limits on Iran’s nuclear program in exchange for the removal of sanctions against the Islamic Republic. The conclusion will, according to Iranian officials, be presented to the United Nations Security Council (UNSC), which will adopt a resolution in seven to 10 days making the JCPOA an official document. Based on the conclusion, which has been concluded with due regard for Iran’s red lines and is considered a nuclear achievement for the country, the world powers recognize Iran’s civilian nuclear program, including the country’s right to the complete nuclear cycle. The nuclear-related economic and financial restrictions imposed by the United States and the EU targeting the Iranian banking, financial, oil, gas, petrochemical, trade, insurance and transport sectors will at once be annulled with the beginning of the implementation of the agreement. Tehran has long denied seeking a nuclear weapon and has insisted on the right to nuclear technology for peaceful means. The prospect of a deal has already helped push down global oil prices because of the possibility that Iranian supply could return to the market. Oil prices tumbled more than a dollar on Tuesday after the deal was reached. The current prices of Oil are revolving around US$50.00 , And it is expected that the Oil Prices will tumble down to a Price of US$40.00, after the sanctions are lifted from the sale of Irani Oil in the International Market. 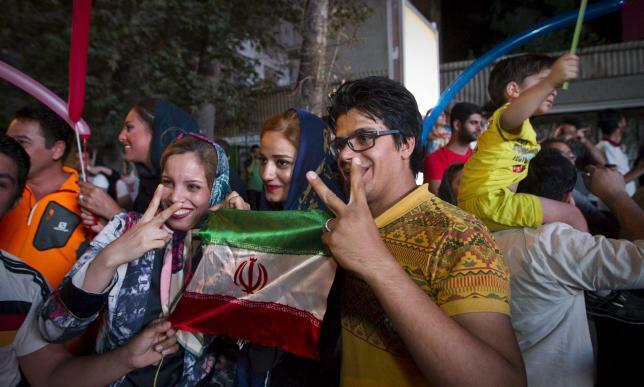 Iranians gesture as they celebrate in the street following a nuclear deal with major powers, in Tehran July 14, 2015. This entry was posted in Europe, Iran News, United States and tagged G5+1, iran, Islamic republic, Nuclear Deal, Sanctions, World Powers. Bookmark the permalink.